A few months ago, Serbin Studio was approached by the Buckeye Valley Historical Society with an architectural challenge. 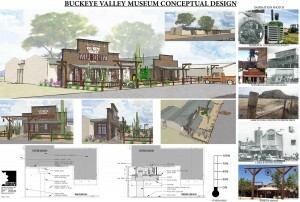 A conceptual design for the exterior of the existing ‘Buckeye Valley Museum’ so that the architecture reflects their mission, ‘To bring a better understanding and appreciation of the history and cultural significance of Buckeye Valley’. 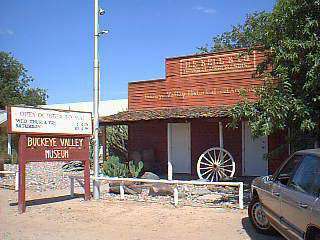 The building today lightly reflects back to the historic architecture of Buckeye Valley and through time has blended into the historic fabric in a way that the building is not apparent to the average visitor in Buckeye. Current museum 2014 . Beige is not the new black. Consult a color specialist when you paint your building. Did I mention Lara Serbin is a color expert. 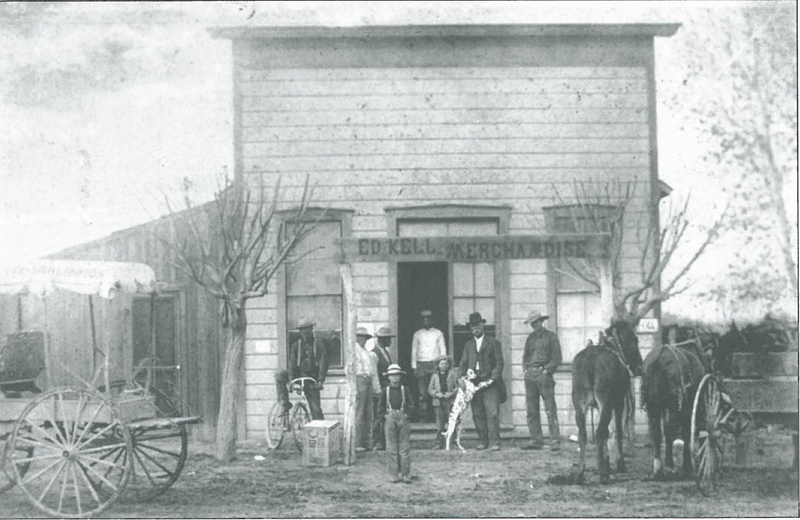 Buckeye has a long history dating back to 1885. Prior to the mid 1970’s, the main highway from Phoenix to California passed through downtown Buckeye. But just as we have seen in the ‘CARS‘ movie, the highway system was created and now by-passes historic downtown. If you want to get a good glimpse of the history of Buckeye, two books written by Verlyne Meck capture Buckeye through images and words. 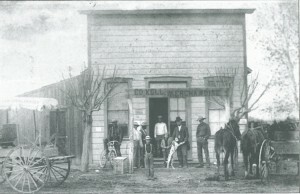 “Buckeye, then and now” & “Buckeye (AZ) images of America”. 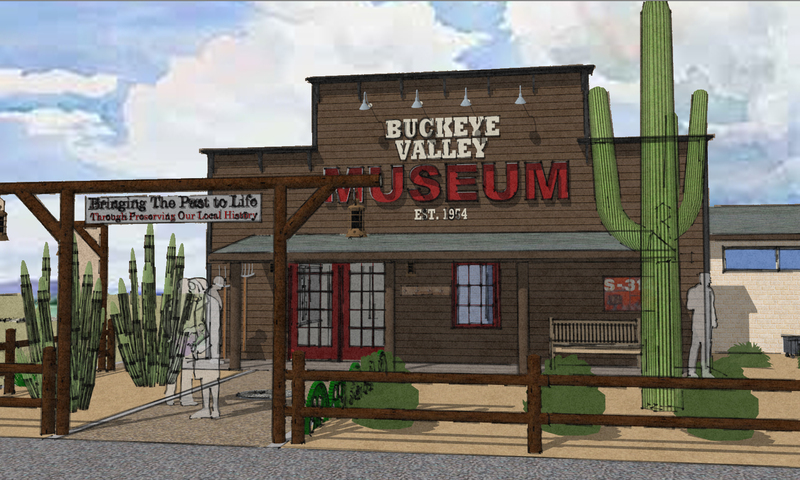 Since being part of a 3rd generation Arizona family and member of the Buckeye Main Street Coalition, I had a good strong foundation for understanding the Museum’s architectural significance. However with every project, further research exposed us to hidden treasures that are only talked about amongst Buckeye residents. 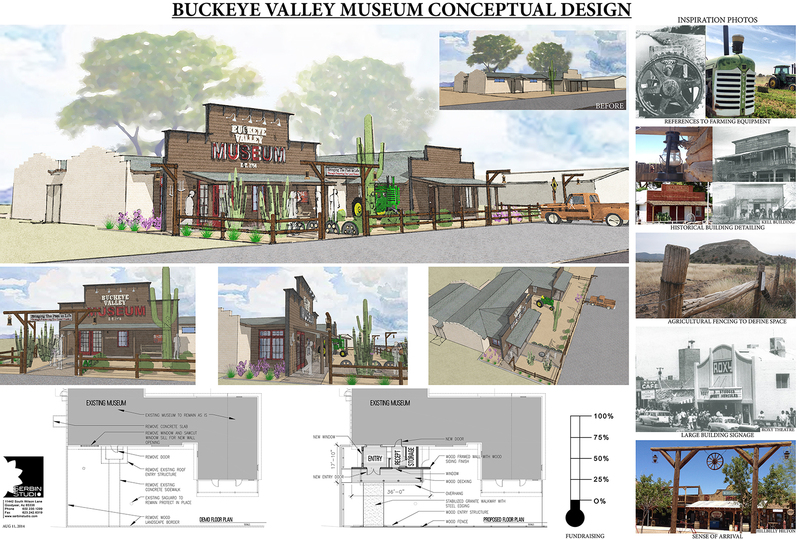 Our intent was to minimally alter the interior exhibits and through the use of architectural features, contextual materials and textures enhance the exterior of the building so it clearly indicates what it is, ‘Buckeye Valley Museum’. We created a sense of arrival and a clear pathway into Buckeye’s history. 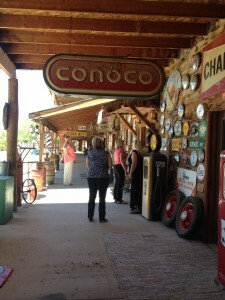 The exterior is now a snapshot of the history and hidden gems within. The museum had a re-opening on September 27, 2014 and is open Friday’s and Saturday’s from 11 am – 4 pm. The interior renovation is complete. The museum is now on a fund raising campaign to raise money and materials to complete the exterior facade upgrades. 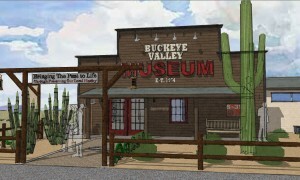 For further information, contact the Buckeye Valley Museum at 623-349-6300.